High quality with attention to detail, the ANSI approved LWT attic ladder is made from quality pinewood assembled in three sections. The LWT attic ladder model is a super-thermo insulated unit recommended for projects that stress energy-saving due to heat loss. The LWT is equipped with a locking mechanism that is installed inside the insulated and sealed door panel. The length of the ladder may be adjusted within 1 inch after cutting the side rails to set the ladder evenly on the floor. Construction of attic ladder provides more steps (tread rise about 10 inches) to improve safety and comfort. A red, metal handrail is included and may be installed on either side of the ladder. Springs are located on door surface to make entry to attic wider and more comfortable (the widest entrance on market - compare to other products). Door is well balanced - it opens and closes easily (NO sudden movements). Fits rough opening 25 in. x 47 in. and ceiling heights 7 ft. 2 in. to 8 ft.11 in. Recommended for projects that stress energy-saving, especially due to heat loss. Attic Ladder (Wooden insulated ) LWT 25X47 300 lbs 8 ft 11 in High quality with attention to detail, the ANSI approved LWT attic ladder is made from quality pinewood assembled in three sections. The LWT attic ladder model is a super-thermo insulated unit recommended for projects that stress energy-saving due to heat loss. The LWT is equipped with a locking mechanism that is installed inside the insulated and sealed door panel. The length of the ladder may be adjusted within 1 inch after cutting the side rails to set the ladder evenly on the floor. Construction of attic ladder provides more steps (tread rise about 10 inches) to improve safety and comfort. A red, metal handrail is included and may be installed on either side of the ladder. Springs are located on door surface to make entry to attic wider and more comfortable (the widest entrance on market - compare to other products). Door is well balanced - it opens and closes easily (NO sudden movements). Fits rough opening 25 in. x 47 in. and ceiling heights 7 ft. 2 in. to 8 ft.11 in. 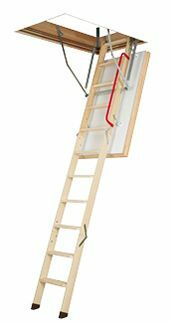 Attic Ladder (Wooden insulated ) LWT 25X47 300 lbs 8 ft 11 in is rated 4.4 out of 5 by 7. Rated 5 out of 5 by GRW from Nice product. Better than my previous in insulated version.... Nice product. Better than my previous in insulated version. Like the latch mechanism that keeps door fully closed and air tight. Rated 5 out of 5 by CG from Nice solid product.... Nice solid product. Rated 5 out of 5 by BigDan from Great well made super!!! would recommande it to install to any one, go for it! Rated 5 out of 5 by maggiek from Solid, dependable We are very happy with our purchase. It is a solid build and feels safe. The only caveat to the instructions was that we had to cut our hole through a plaster and lath ceiling so as far as install goes, it's an hour and a half to install AFTER the hole is properly cut and framed. The cut and framing was the biggest part of the job. Rated 5 out of 5 by Fire Dog from Safe attic access yet remains hidden ! We wanted a particular attic ladder to meet our needs and Home Depot supplied it right to our door! Gaining access safely and ease of use was our wish. Price was reasonable as well. Our ceiling was higher than normal which poses a problem but this met the need. We are very happy with the purchase. Rated 5 out of 5 by paulM from Solid ladder Easy to install, well made, looks good, works well. Rated 1 out of 5 by Kurt from No written directions. No included hardware (screws, etc.) Bracketry is soft chinese-made junk. A... No written directions. No included hardware (screws, etc.) Bracketry is soft chinese-made junk. Avoid!